Chestnut filly by Dream boy out of All Grace by Allermund. Should mature around 16.1hh. Her dam All Grace is a sweetie and competed to Medium Dressage. Day Dream is a super filly with 3 good paces, good conformation and an easy temperament. Her trot is very rythmical with a good moment of suspension. She has also shown the ability to jump (out of her paddock!). We have competed Day Dream and she has 34 prelim dressage points from 2 outings last spring, with scores of over 70%, as well as 72% in the Horse Power qualifier. By Gymnastik Star out of Gratiola by Graf Landau, dam a Winterkonig mare. Imported from Australia, she is an Australian Premium mare. She is now competing successfully in Dressage and has gained over 100 points in her first season. Gratiola's dam's full brother 'Wiking' represented Australia in Grand Prix dressage. 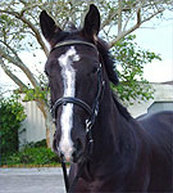 Gluck Star will mature 16.2 or 16.3 hh and is dark brown. He has amazing floating movement, is a real eye catcher when he moves. He is very quiet and friendly, should go to the top with the right training. Three year old gelding by Anamour ex TB mare by Engagment. 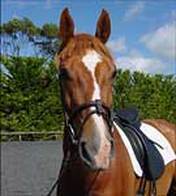 Very attractive chestnut with a blaze and 2 alternate socks who will mature over 16.2hh. Lovely attitude, excellent walk and canter, very rhythmical trot, free through shoulder. 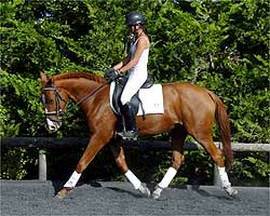 He has everything to make a top dressage horse, just needs the right rider. Going kindly. 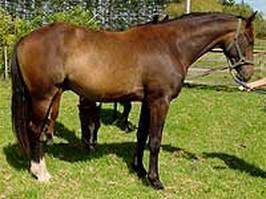 Gelding by Anamour, dam by Allermund ex a Winnebago mare. Black with 2 white socks on the same side and a blaze. He is now 4 years old and currently standing 16hh. Alacazam has good bone, three very good paces and a super temperament. He has been undersaddle since June and is very co-operative, does what ever we ask of him. Has been also been hacked out and about. 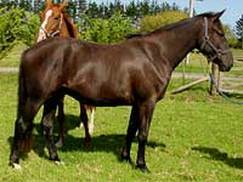 Black gelding by Anamour out of a Witzbold mare Witzlana. Witzlana was a champion hack and competed SJ and Show Hunter, qualified for HOY show. Apollo will mature around 16hh, has 3 good paces, he has freedom in his shoulder to move well. He is very quiet and cuddly. Will be an easy to horse to school and have around. Is very black, attractive with his white markings.